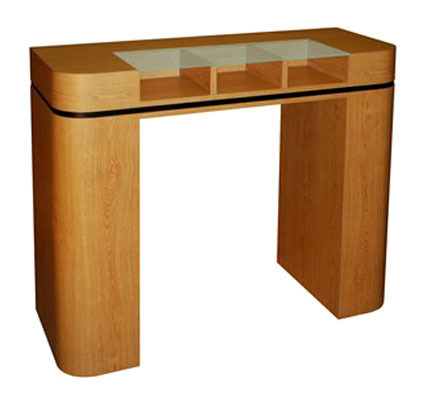 This beautiful and sleek single-sided check stand, with the elegant curved ends and black horizontal feature strip, will upgrade any facility. It is 48 inches wide by 42 inches high by 19 inched deep. Under the flush-mounted acrylic writing top are three compartments for materials up to 9-1/2 x 11. It is finished on all four sides and comes in choice of ten colors. Ships fully assembled. This beautiful and sleek single-sided check stand, with the elegant curved ends and black horizontal feature strip, will upgrade any facility. It is 48 inches wide by 42 inches high by 19 inched deep. Under the flush-mounted acrylic writing top are three compartments for materials up to 9-1/2 x 11.